Part of Ganges Hill, which is considered an unsafe route for pedestrians and cyclists due to narrow, unpaved shoulders. With work to improve pathways on Rainbow and Lower Ganges roads stalled, the island’s transportation commission wants to shift referendum funds approved in 2014 to start work on creating a Ganges Hill pathway. After some discussion, the commission agreed to allocate up to $250,000 for Capital Regional District staff to present design concepts on ways to make Ganges Hill safer for pedestrians and cyclists. In 2013, the CRD’s regional parks department commissioned a feasibility study on building bike lanes and a walking path on Fulford-Ganges Road from Seaview Avenue to Beddis Road. The report done by consultants JE Anderson concluded it would cost between $2.35 million and $2.66 million to build bike lanes on both sides and a sidewalk on one side of the road, not including potential property purchase costs. Anderson recommended consideration of a third option, which was to widen the gravel shoulder by 1.8 to 2.5 metres on the west side of the road. That option was estimated to cost $750,000. SSITC members learned at the previous month’s commission meeting that a culvert required for the Rainbow/Lower Ganges project passes through a well-documented First Nations village site — DfRu-009 — which was recorded in 1974. As a result, no work can proceed until a site alteration permit is received from the province’s Archaeology Branch. At the April meeting, the commission asked staff to determine if work could be done on all other areas besides the section in question. Salt Spring CRD engineer Chris Davidson reported on May 28 that doing so was not a possibility and recommended that all archaeological issues be addressed before any work begins. Davidson estimated that a site alteration permit would take at least three to four months to process. Otherwise, he said, the tender for work required is ready to go. 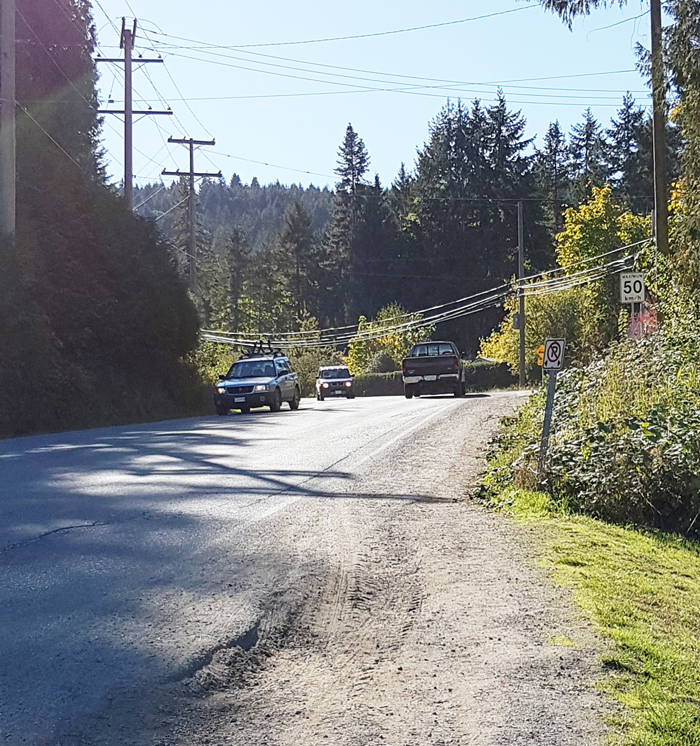 In November of 2014, Salt Spring ratepayers authorized the SSITC to increase the requisition for the transportation service by $250,000 per year — from $146,250 to $396,250 — for the 2015-2018 taxation years. Funds were to be used to undertake work outlined in the North Ganges Transportation Plan (NGTP). During the 2014 referendum campaign, the SSITC said the first priority would be construction of a pathway along Rainbow Road and on part of Lower Ganges Road. Also at the May 28 meeting, Williams said the commission would like to see a spring 2019 referendum seeking voter approval for continued annual support for NGTP projects.